A veteran NASA spacecraft in orbit around Mars is slowly bouncing back from a malfunction suffered last month, but mission managers expect the orbiter to make a full recovery, agency officials said. 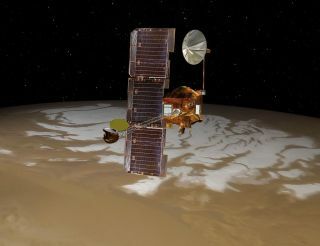 In early June, NASA's Mars Odyssey orbiter lost the use of one of its three reaction wheels, which help control the probe's attitude and orientation in space without needing to fire thrusters. When the wheel jammed, Odyssey placed itself into a so-called safe mode, which points the spacecraft toward Earth (rather than its normal downward position facing Mars) to ensure better communications access. Mission controllers then instructed Odyssey to use a spare reaction wheel onboard as they assessed the situation. On July 11, after performing a maneuver to adjust its orbit, Odyssey again placed itself into a precautionary safe mode. The spacecraft remained in this state for 21 hours before mission managers began recovering normal operations, according to NASA officials. Mission controllers are expecting the 11-year-old orbiter to eventually resume its regular tasks. "We are on a cautious path to resume Odyssey's science and relay operations soon," Gaylon McSmith, Odyssey project manager at JPL in Pasadena, Calif., said in a statement last week. In addition to mapping the surface of the Red Planet, Mars Odyssey also acts as a key data relay station between NASA's Mars Exploration Rover Opportunity and Earth. Odyssey's glitch, however, did not affect the rover's ground operations, Webster told SPACE.com. NASA is also planning to use Odyssey to help relay information during the upcoming landing of its newest Mars rover, Curiosity, which is set to touch down on the Red Planet on the night of Aug. 5. Originally, Odyssey was expected to have a full view of Curiosity's landing on Mars, but the glitch last month may have altered the orbiter's position in space, said Doug McCuistion, director of the Mars Exploration Program at NASA Headquarters in Washington, D.C.
"Odyssey looks like it may not be where we expect it to be," McCuistion said in a news briefing Monday (July 16). This means that ground controllers may have to wait several minutes before knowing whether the Curiosity rover survived its harrowing trip through the Martian atmosphere. To prevent any kind of delay, NASA may opt to move Odyssey to ensure that it can collect uninterrupted observations of Curiosity's landing. A final decision on the proposed maneuver has yet to be made, Webster said. Mars Odyssey was launched in April 2001 and has been orbiting the Red Planet longer than any other Mars mission in history. The 11-year-old orbiter has been mapping the Martian surface to study the planet's chemical and mineral distribution.